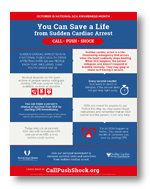 Sudden Cardiac Arrest (SCA) is the third leading cause of death in the U.S., affecting more than 356,000 people1 each year, including more than 7,0002 youth under age 18. The SCA survival rate has remained at about 10 percent for 30 years1 because we aren’t as prepared as we should be to help save lives. 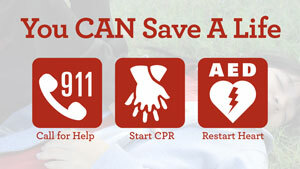 Since 7 in 10 sudden cardiac arrests occur at home, being prepared means you could save the life of someone you love. A medical emergency can be confusing and frightening, which can delay getting help to the victim. It’s vital to prepare now to be ready to take immediate action when needed. 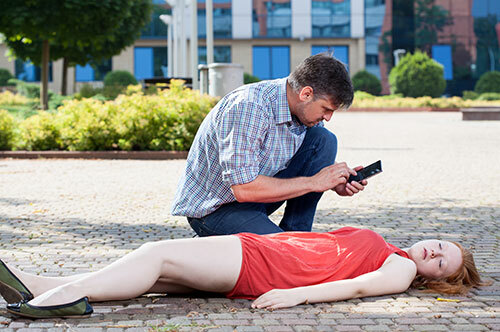 When someone suddenly collapses and is unresponsive, they are likely having a sudden cardiac arrest. While there may be several seconds of seizure activity or gasping, their heart has stopped and they are not breathing. Don’t spend time trying to wake them up—they won’t and your fast response is crucial. Push hard and fast in the center of the chest; 100 to 120 compressions per minute. 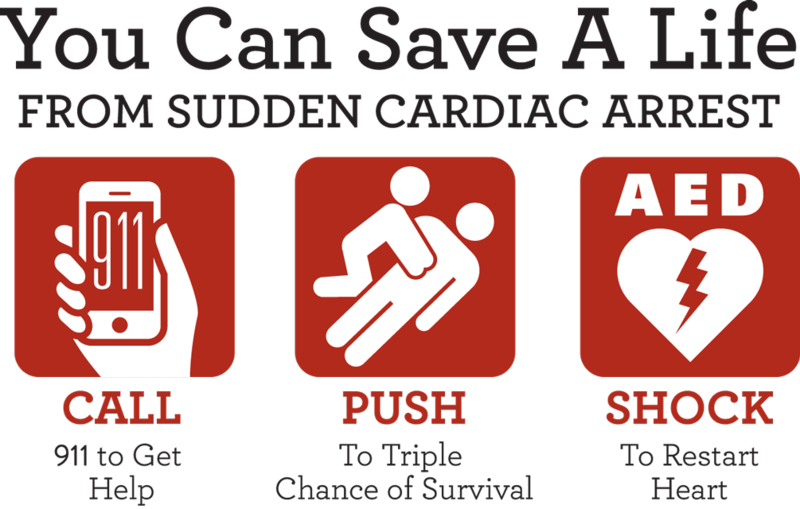 Follow step-by-step audio/visual instructions and remember that an AED cannot hurt the person, it can only help. Today only one in 10 survives Sudden Cardiac Arrest. 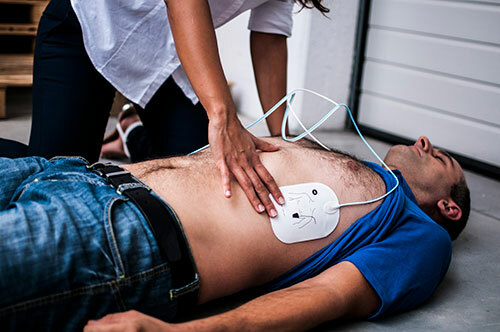 But with immediate CPR and use of an AED, five in 10 victims could survive. It’s a fact that CPR and AEDs can save lives. 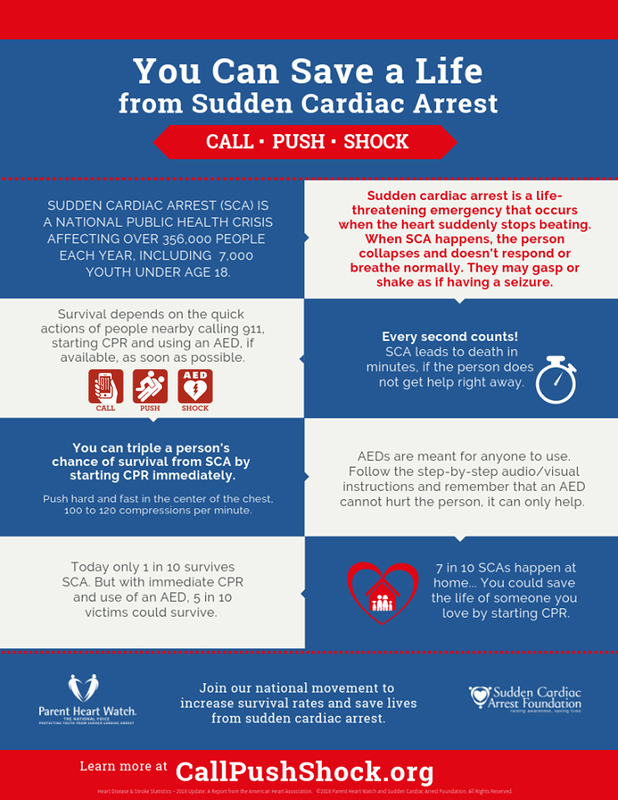 But there is a critical need to raise awareness about SCA, educate people about the importance of taking immediate action, and empower communities to provide CPR training and widespread access to AEDs. Consumer research-tested graphic of SCA explanation to post to your website, newsletter, etc. To join the campaign please reach out to us at contact@callpushshock.org. For more information reach out to contact@callpushshock.org. Watch what people have to say once they learn how critical it is to use CPR and an AED on a Sudden Cardiac Arrest victim. members of the National Cardiac Arrest Collaborative.